We thought Micron would report Monday night, March 18th, per the ThomsonReuters data, but in fact MU reports Thursday night, March 21st after the close. We havent owned the stock in years. Analyst consensus is looking for a loss of $0.20 per share on $1.9 billion in revenues, Thursday night. The earnings per share (EPS) estimates look horrid for the fiscal year-end August, 2013, but the revisions are starting to turn positive. The fiscal 2014 estimate is looking for $0.64 per share on $8.4 billion. There is apparently what looks to be sustained strength in DRAM pricing, which is unusual given that DRAM’s have always been associated with PC activity. What caught our eye from the attached chart is the improving base, and what looks to be accumulation occurring in the stock. 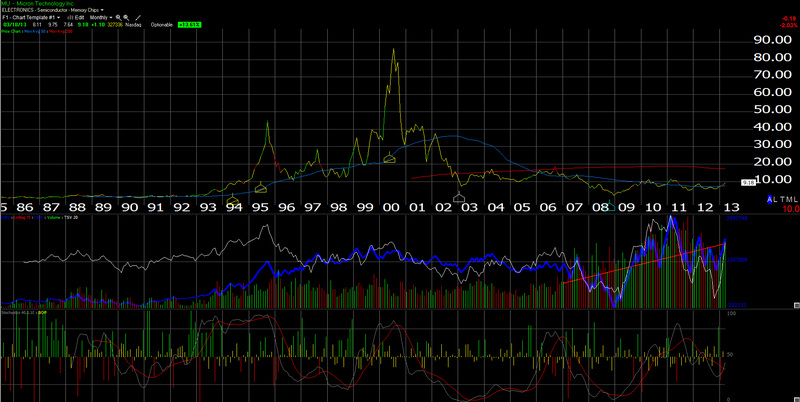 In the 1990’s, as the attached chart shows, the stock rose from $1 to $100 in a period of about 9 years. I dont expect that to happen again, but MU is a leveraged play on DRAM prices. Stranger things have happened. A trade abvove $20 would be crucial, but just a trade from its current price to $20 would be a nice pop. Micron is like an airline – the capex for the business often exceeds profitability for a very long time. Know what you own.